The Eagles offensive line didn't have a fun time early in Sunday's game against the Giants. In fact, they were getting beaten at nearly every turn. Michael Vick was taking hits, LeSean McCoy couldn't find holes. It wasn't pretty. Kiwanuka, playing nose guard, manhandles Reynolds while Mathis looks the other way. McCoy blocks the blitzer, but Watkins doesn't get help from Reynolds on Rocky Bernard. Reynolds, pulling, whiffs on Chase Blackburn. Bell also can't sustain block on JPP. Herremans gets beat inside by Justin Tuck. JPP beats Bell around the edge. Linval Joseph busts by Reynolds. Communication issue leaves blitzer unblocked. 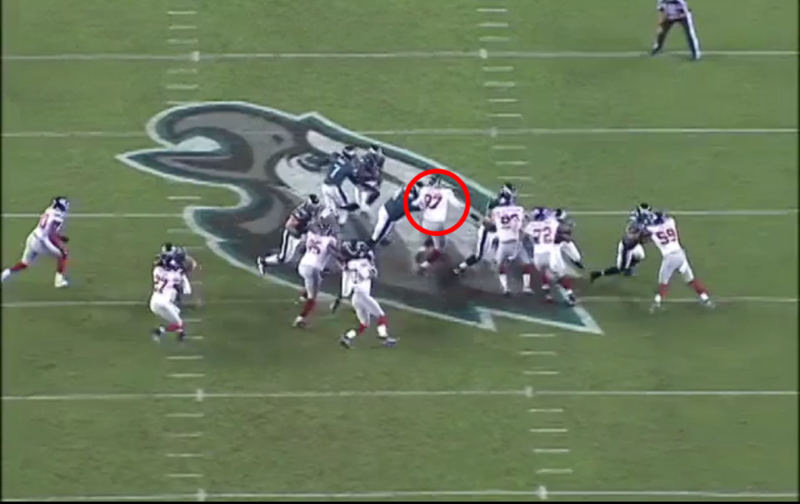 More All-22: How The Eagles Offense Made It Easy On Mike Vick; Hey Look, An Eagles Run Game! Tagged with Pass Blocking, Todd Herremans, Philadelphia Eagles, NFL, Danny Watkins, All-22, Offensive Line, Run Blocking, Dallas Reynolds, New York Giants, Demetress Bell, Week Four.